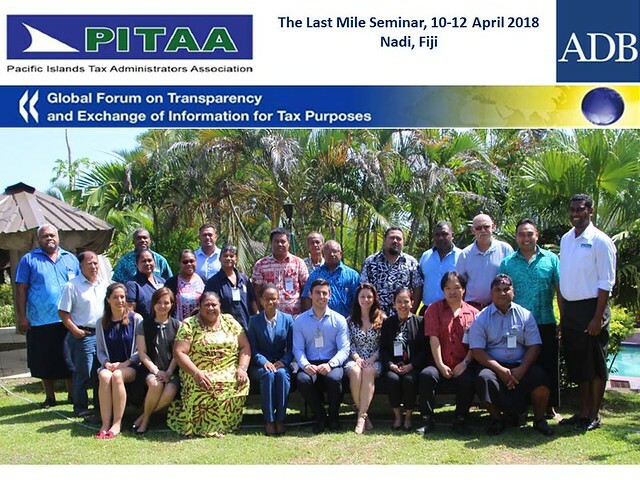 More than 20 tax auditors, tax investigators and Exchange of Information (EOI) officials from the Pacific region met in Fiji, on 10-12 April 2018 for a three day training seminar organised by the Secretariat of the Global Forum on Transparency and Exchange of Information for Tax Purposes in cooperation with the Asian Development Bank (ADB) and the Pacific Islands Tax Administrators’ Association (PITAA). The aim of the seminar was to assist officials in PITAA tax administrations to effectively utilise the EOI tools contained in tax treaties and EOI agreements in the course of their tax audits, reviews or investigations that have cross-border aspects. Tax auditors, and/or other officials, were encouraged to promote and make effective use of these EOI tools by increasing the number and quality of outgoing requests to their treaty partners to help tackle the compliance risks faced in their jurisdiction. The seminar seeked to strengthen awareness that the protection of domestic revenue is closely linked with the effective use of EOI. Practical case studies were used to illustrate how to make EOI requests, and these were designed to reflect regional issues (such as tourism) so as to be particularly relevant for PITAA members.